Дерронес. The Derrones AR dodecadrachm / Греция и острова / Античная Греция / Нумизматика. Монеты Архаика Антика ... / Ваше Хобби Good Hobby. Античные монеты. Фото галерея. Новости. Магазин. Коллекция. Додекадрахма (12 драхм). Македония, Дерронес. 500-450 г.д.н.э. Серебро. 33,7гр. VF. 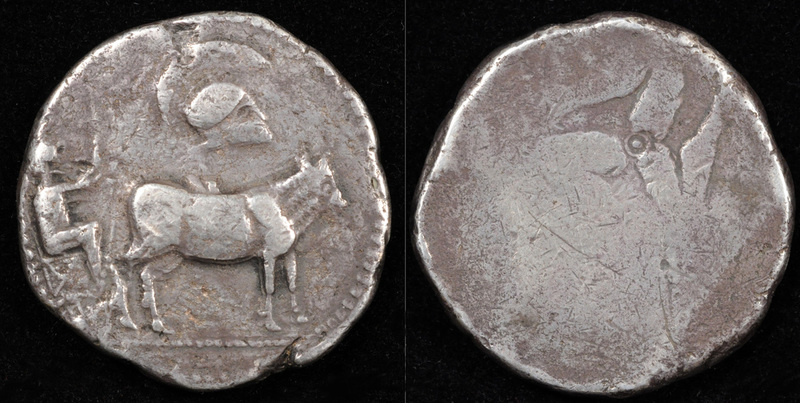 Thraco-Macedonian Tribes: The Derrones AR dodecadrachm - Ox cart and helmet/Triskeles - Well centered on very broad flan; excellent obverse strike for type; excellent metal. Thraco-Macedonian Tribes: The Derrones AR dodecadrachm (12 drachms), ca. 500-450 BC, 33.70 gm, 38.3mm. Obv: Male charioteer driving ox cart right, Corinthian helmet in field above oxen; P-E-I (reverted characters) in field.Rev: Triskeles of human legs in shallow incuse. VF, well centered on a very broad flan which contains entire circumfrence of obverse border; excellent obverse strike for this type; excellent metal; weak reverse strike, as usual for this type.